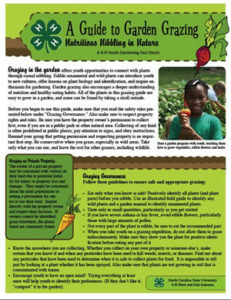 This guide is intended for teachers and youth garden educators to get started planting a vegetable garden with kids. 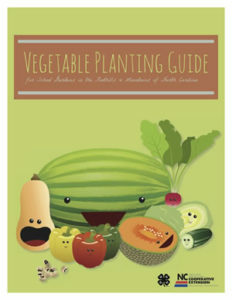 This guide is intended for teachers and youth garden educators in the Piedmont and eastern part of NC to grow a vegetable garden with kids. 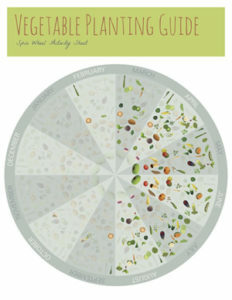 Kids can dig into what to plant and when with this spin wheel. For Piedmont and Coastal Plain. Use this pub with kids to let them figure out what to plant and when! Spending time with your family outside has many benefits. 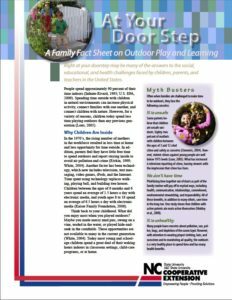 Going outside has been shown to reduce obesity, contribute to better health, reduce media addiction, and counteract the effects of attention deficit disorder and other learning problems. This guide has a number of engaging ideas to explore nature, right outside your doorstep! 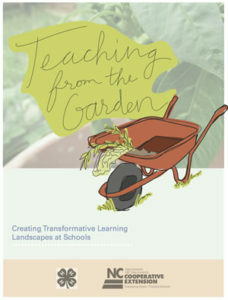 Dig into the planning and building of your school garden with this easy start up guide. Work with your community to come up with big ideas and break ground by creating a space ripe for learning! 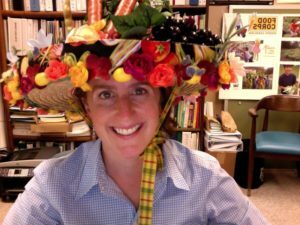 Today’s community food systems, including school and community gardens, horticultural therapy programs, and urban agriculture education NGOs, are richly complex. 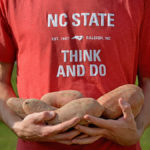 Working within these systems, staff and students will help individuals from a range of backgrounds combine their strengths to achieve the common goal of food production. This manual includes group activities, roleplaying exercises, and prompts for discussions that will increase community instructors’ confidence and improve their teaching skills. 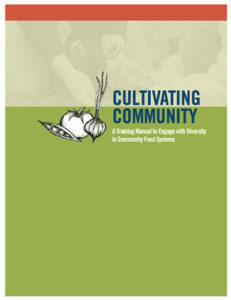 We will briefly explore diversity concepts, discuss cultural differences, and practice community education engagement strategies, all within the context of food systems. 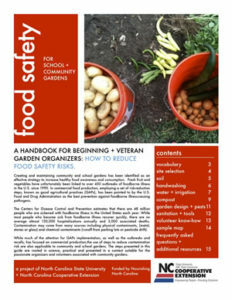 This document provides a blueprint for making a garden as safe as possible, marked with best practices to do so, and provides some tips on how to make already-established gardens safer. 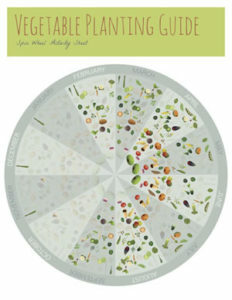 This handbook should be helpful whether you are just starting out, taking over the garden for someone else, or have been gardening for decades. Muscadine grapes are a native North Carolina treasure. Rambling throughout the southeastern United States, muscadines are easy to grow and maintain, and they burst with flavor and nutrients. The deep purple and bronze-toned fruit clusters adorn farms and gardens and are spun into smoothies and grape hull pies, delighting the taste buds of children and adults alike! 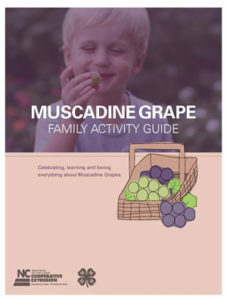 This family activity guide is full of rich information and ideas to learn more about and celebrate muscadine grapes! Looking for more technical information on how to plant and grow just about anything? Visit this extensive collection of Horticulture Extension Publications. • What Better Time to Fall Back Into Helping Others Than Fall?